Our recent feature on the shops and traders of Woodgrange Road at the turn of the last century (see here and here), has provoked a flurry of local interest in the fate of the Forest Gate fire sub-station. So, we dug around a little and owe considerable gratitude to local historian and fire service expert, Peter Williams, for what follows. Peter is doubling up his contribution to this blog with a small display at CoffeE7, showing how things looked from their cafe window in 1900 - with the fire service in mind. So, pop along, have a coffee, and catch up on local heritage! We've trawled through the excellent Newham Story website (see here), local photographs, maps, trade directories and Peter's detailed knowledge of the Fire Service, and put the following together. 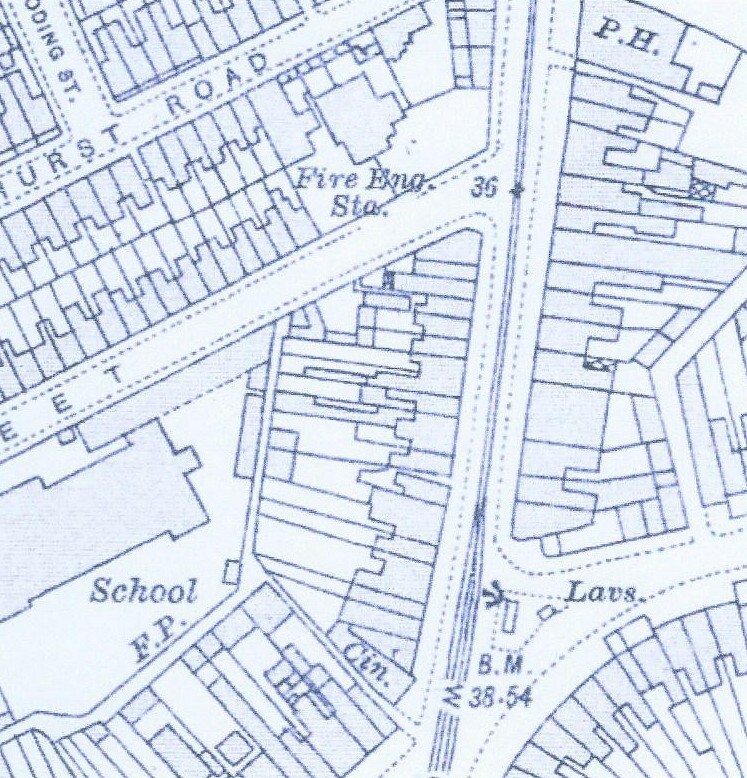 The first record we can trace of a fire service presence in Forest Gate is in the 1890 Kelly's Street Directory, which simply states that there was a "Fire Engine Station" on Woodgrange Road. 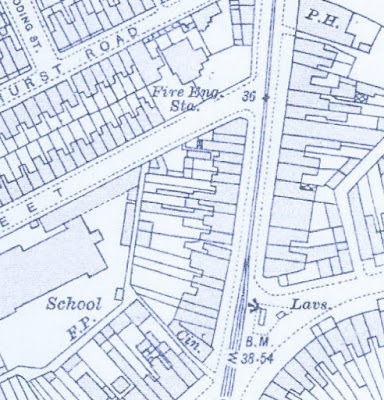 This mention is confirmed by the 1893 Ordnance Survey Map (see below, for extract), which shows a "Fire Station" at the junction of Woodgrange and Sebert Roads - where it appears to be adjacent to a public toilet. of Woodgrange and Sebert Roads. 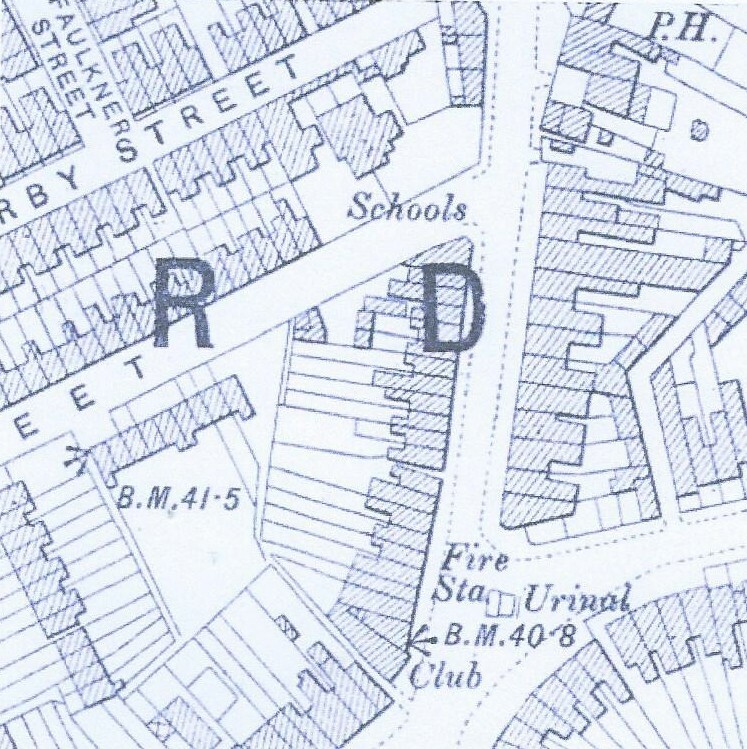 The 1900-01 Kelly's Directory - used for the 'Woodgrange Road in 1900' blogs - confirms the location, as being in front of what is now the dentist, with the confusing "Market Place" carving on the (sadly neglected) building, at the Woodgrange/Sebert Road junction. 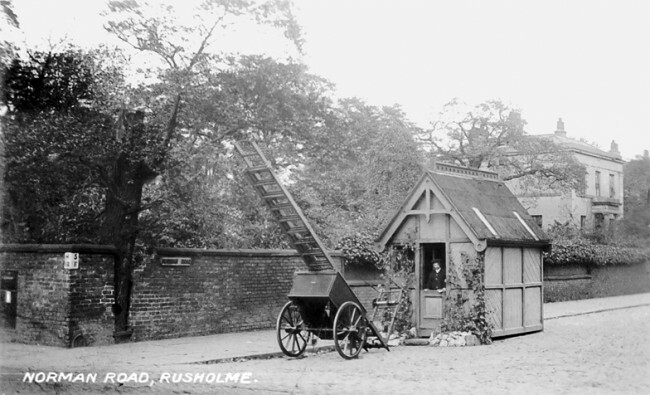 An early 20th century postcard (see below) shows a small wooden hut with a tall ladder in front of what is now the dentist. The detailed enlargement, immediately below this, clearly shows what was then known as a "Street escape station" - effectively a local sub-station for the West Ham Fire Brigade. The borough service was then based adjacent to Stratford Old Town Hall, the outline of which can still be seen today. The "Street escape station" consisted of a man and a ladder, which would be rushed off to any local fire or emergency. Below is a close-up photograph of one, from Manchester. The escape weighed about half a ton, so having received notification of a local fire to be fought, the watchman's first task would have been to recruit passers-by to assist him in dragging the appliance to the incident! This, clearly, could only provide a limited and primitive service. There is no indication of this Fire Service location and presence in the 1902-03 Kelly's Directory. By 1908 a more effective local fire service sub-station had been built on the corner of what was then Forest Street, and is now occupied by the Lord Lister clinic, on Woodgrange Road. 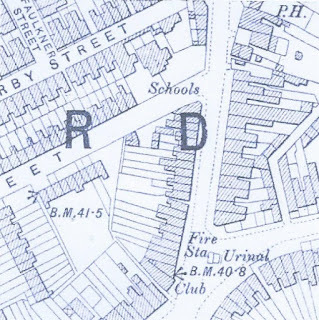 (see 1920 Ordnance Survey map, below for location). n.b. there has been some change in the layout of the streets in the years since this map was made. The photo, below, shows a team of firemen at this location - some of whom would have been part-time or voluntary or auxiliary. Their vehicle was horse-drawn. The man in the centre of the front row of this photo was Henry Dyer, who was a local undertaker and mayor in 1914-15. He featured in our blogs on the local WW1 Hammers Battalion (see here, for details). It is likely that this photo was taken in or around the outbreak of the war. 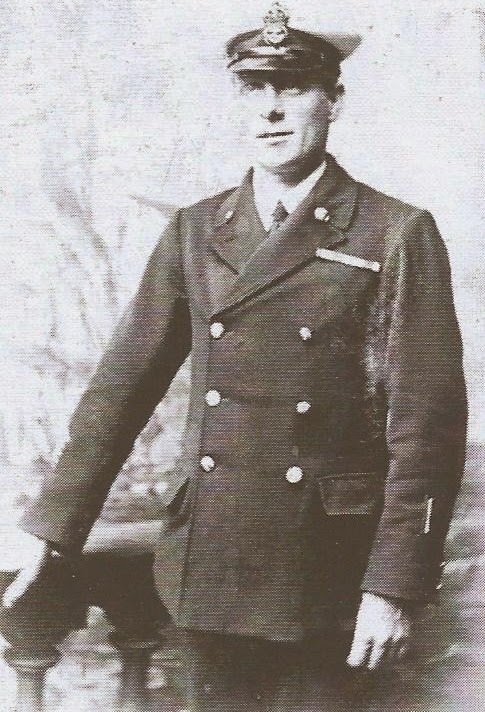 We have few details of the local fire service over the next decade - including during World War 1, although we know that the station managers from 1908 - 1922 included Edward Smith, W Stringer and Alfred Braddick. Motorisation of the fire service fleet - particularly after the war - almost certainly sounded the death knell of the Forest Gate fire service presence. We know that the Forest Gate depot replaced its horse-drawn vehicle with a motorised one in 1920, but it was not a hitch-free process. 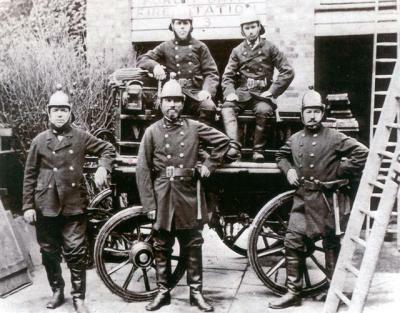 Prior to the introduction of the motorised fire engine, the Forest Gate station operated with one horsed fire escape, two horse carts and three firemen. The annual revenue cost of the service was a little under £630. Although a motor vehicle was introduced to Forest Gate in 1920, by 1922 its big end had broken and the service was forced to acquire 2 horses from the council's stables - presumably to draw the pre-motorised fire vehicle to local incidents. A temporary backward step in the onward march of progress! 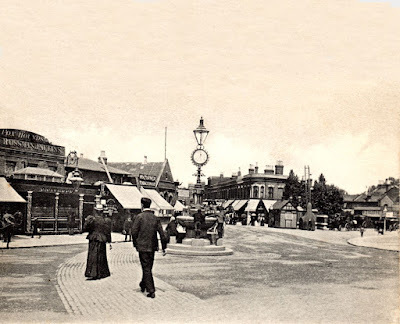 Motorisation, however, meant that vehicles could reach Forest Gate swiftly from the main West Ham station in Stratford, and so the pressure was on to rationalise services and close the Forest Gate sub-station. It was, in any event, a fairly quiet facility; having attended only 15 incidents in 1919, seven the following year and 18 in 1921. A two-shift system - greatly resisted by strong trade unions at the time - was being introduced in Stratford in the early '20s, which would have meant a more comprehensive service for the borough generally. 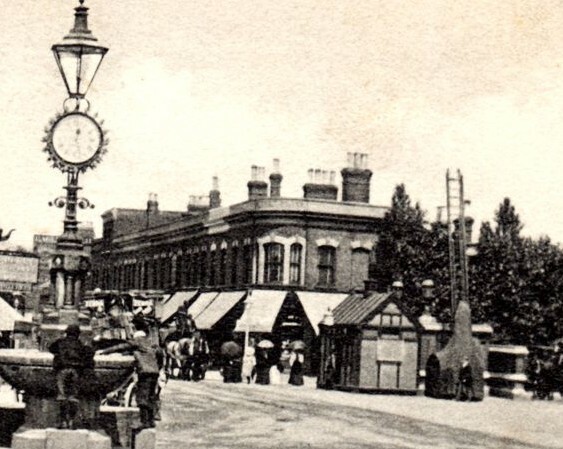 The Forest Gate sub-station was finally closed on 31 May 1923 and the premises were taken over by the electricity department of West Ham council, which generated and supplied electricity in the borough, at the time. As part of our on-going series examining Forest Gate's role in World War 1 (see footnote for links to other articles), we are running a two-part blog on Forest Gate residents' participation in the West Ham Battalion ("The Hammers") during that war. 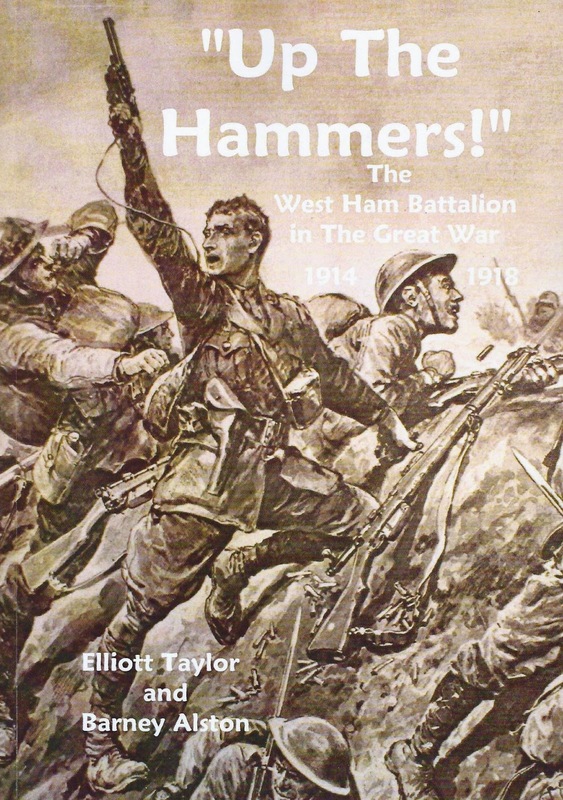 We are entirely indebted to the tremendous work done by authors Elliott Taylor and Barney Alston in their recently published book Up The Hammers, available from the Newham Bookshop, Barking Road, and through their publishers, Amazon - see footnotes for details. This, the first episode, traces the story from the establishment of the battalion in December 1914, until the outbreak of the Battle of the Somme on 1 July 1916. Wherever possible, we have tried to track the addresses of local volunteers and added details (including some contemporary photographs) to the authors' accounts, from censuses etc. We cannot recommend their book highly enough to anyone touched by the events described within these articles, as it gives a much lengthier and fuller account of an important part of West Ham's history. Following outbreak of WW1 a number of "Pals" Battalions were formed, groups of mates, who joined up together in localities, throughout Britain. The West Ham Battalion was one of them, and established on 29 Dec 1914. Forest Gate skating rink, Woodgrange Road, was temporarily secured as a drill hall. The battalion was given the name "The Hammers" and 120 men were recruited within a fortnight. - used as a drill hall for "The Hammers"
An early volunteer was William Walter Busby of 14 Sherrard Road. He was 24, worked as a chemical analyst and was studying for a BSc. He had been a member of the Officer Training Corps, as a student, and was a founding member of the 2nd West Ham Scouts, eventually to become the borough's district commissioner (see here for details). He and his family were well established members of Sebert Road Congregationalist church. Members of his family continued their association with the church and authored its official history in the 1950's. The Hammers Battalion book's authors have been fortunate in obtaining fairly detailed diaries of William Busby's movements, at home and abroad during World War 1, and we are grateful to them for being able to quote so extensively from these, in what gives a full picture of both the man, himself, his friends and the conditions they and his comrades endured during the war. Battalion recruits were housed on hastily constructed wooden huts in the grounds of the 'Old House' in Wanstead Park, which today is part of the golf club. 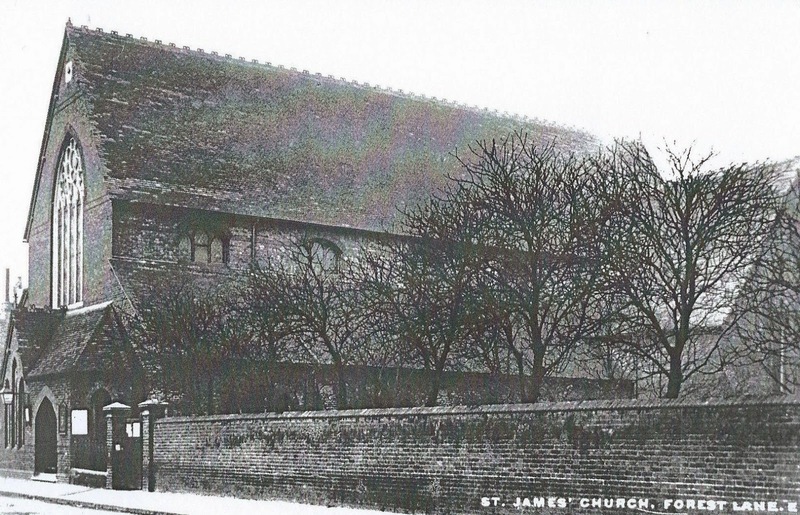 By the end of February they had over 1,000 volunteers and two weeks later they held a recruiting parade and march, around St James' church, Forest Gate, which lead to another influx of local recruits. Local venues provided entertainment to the volunteers. 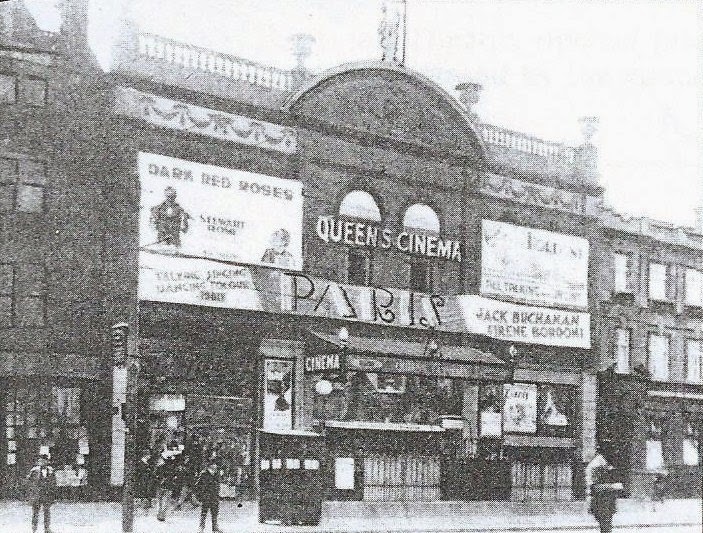 The staff at the Queens cinema on Romford Road, according to the authors, opened their doors and 850 of the filed in to watch the latest films. 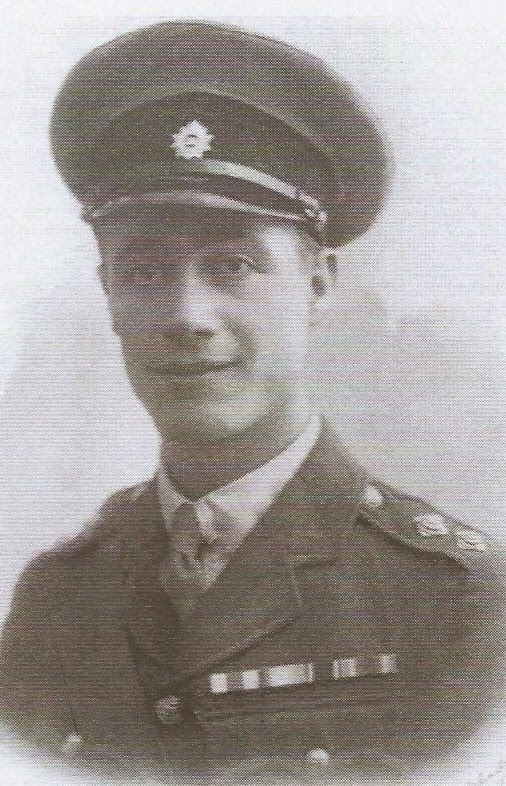 Among the Forest Gate volunteers were friends of William Busby - who was soon elevated to become 2nd Lieutenant - like 17-year old Bernard Page and Leonard Holthusen. 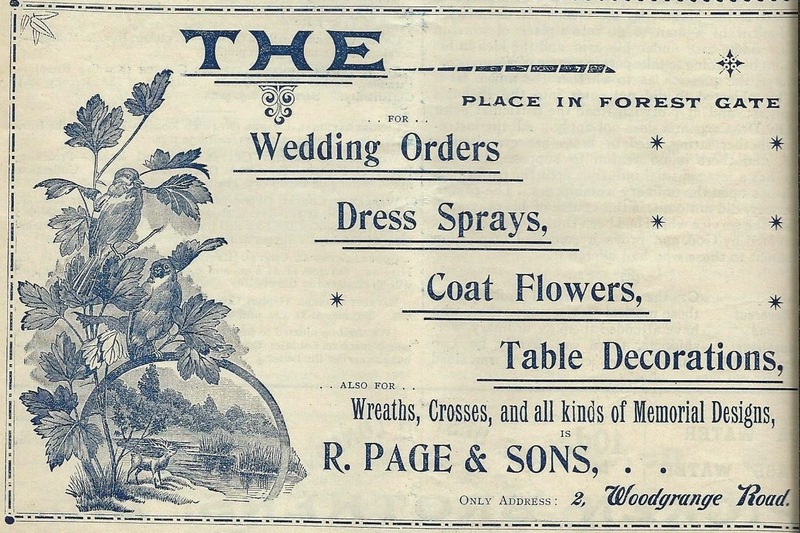 Page's father, Robert Henry, was proprietor of a successful chain of florists throughout the area (including 2 Woodgrange Road - see here for further details), and lived at 143 Earlham Grove. Twenty nine year old Leonard Holthusen was an engineering surveyor, living at 102 Claremont Road. He became the battalion's first signals officer. His older brother, Alan, of the same address, was a local GP, with a surgery a few doors from the Sebert Road Congregational church. 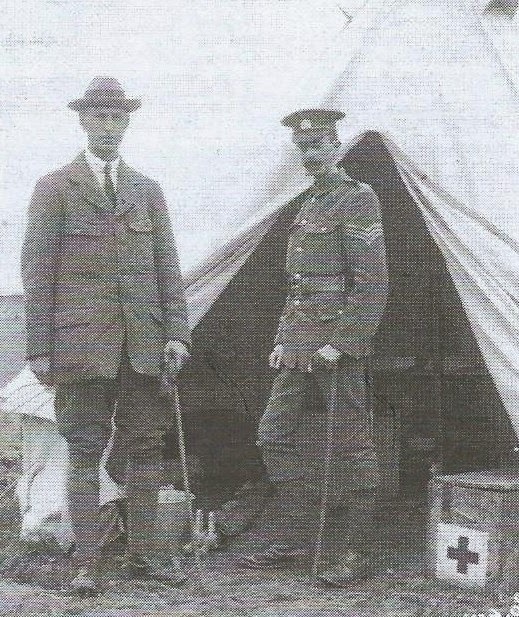 He was quickly appointed the battalion's first medical officer. Their father, also of Claremont Road, was an "ornamental confectioner and Christmas cracker manufacturer". On 23 March 1915 1,300 of the battalion mustered on Wanstead Flats and were inspected by Major General CL Woollcombe of Eastern Command. A month later a route march was undertaken, after some physical drill on the Flats. The journey took them to Manor Park, via High Street North, to Barking. They then marched along Green Street, past West Ham's Boleyn ground and back to Wanstead Flats (via Stratford). The following month there were anti-German riots in Forest Gate (see previous blog), and one magistrate commented in court that: "A West Ham Juvenile Battalion of thieves should be raised", owing to the number of children that defendants claimed had been responsible for the looting. "The Hammers" paraded beneath their home-made colours on Wanstead Flats for the last time on 16 May 1915. Many turned out to hear the service from the Bishop of Barking and a lesson by the Mayor, Henry Dyer - who, ironically, as time was to tell - had a very successful undertakers' business at 54 Woodgrange Road (see here). 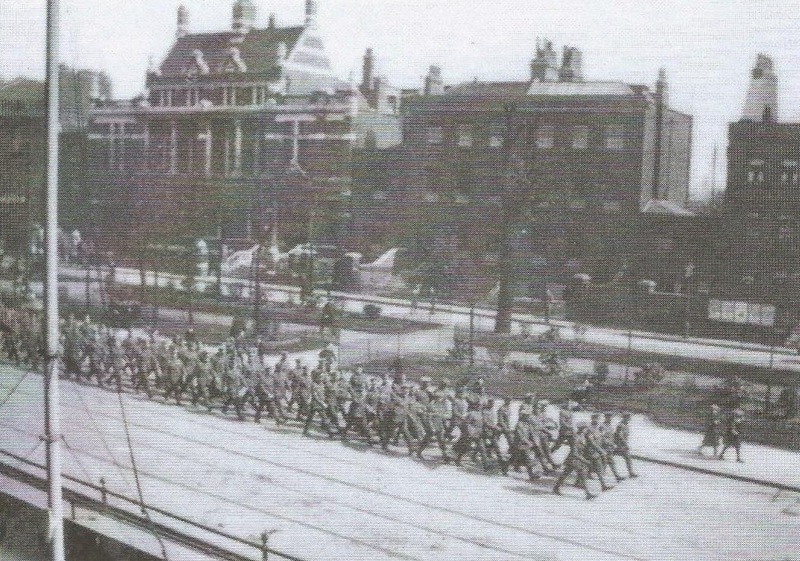 The battalion left the district for the last time on 19 May, and the Stratford Express reported: "They appeared more like a joyous crowd of excursionists than that of a battalion of fighting men with such stern work ahead of them". They were seen off by Henry Dyer, who was honorary Colonel of the West Ham Battalion. They marched to Brentwood, for further training. In mid July they were sent to Mansfield, for additional preparation, then to Salisbury Plain. On 17 November they were on their way to France. 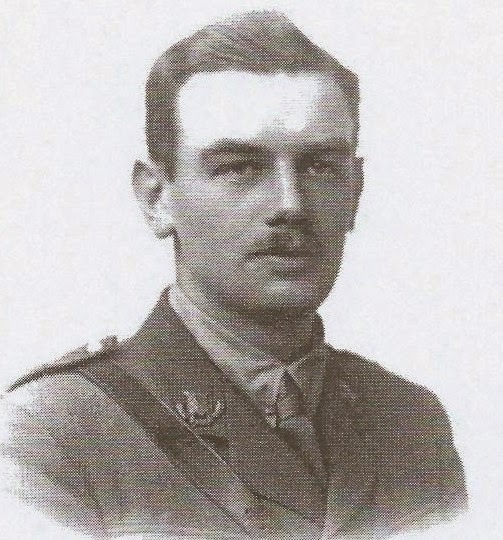 One of the officers in the advanced party and responsible for the onward transport and accommodation arrangements was Lt Gilbert Simpson, of Osborne Road. He would appear to have been a 23 year old civil servant, previously of 3 Knighton Road, Forest Gate. 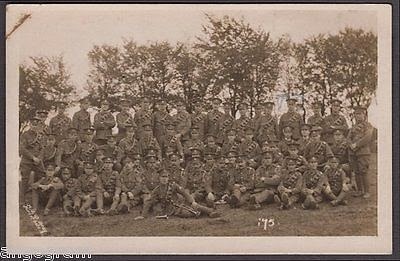 "The Hammers" were, formally, the 13th Battalion of the Essex Regiment, and once in France they became part of the 2nd Division of the 6th Brigade of the British Army. On arriving in France, the battalion made its way, by train, to St Omer then on to Bethune, on foot, where they were billeted in an old tobacco factory. Reality of life in and around the trenches soon hit - cold, over-run by vermin, sleepless nights, constant artillery bombardment, boredom. A truce, of sorts, provided some relief over Christmas, although that day's dinner didn't live up to hopes. William Busby noted in his diary that it: "was not altogether a success ... the cooks were drunk", on the rum meant for the soldiers! Len Holthusen was able to provide some relief, when he brought news that West Ham had massacred Arsenal at the Boleyn Ground, 8-2, on Christmas Day, with Syd Puddefoot banging in five. Using surviving official battalion diaries, Taylor and Alston are able to describe the movements of "The Hammers" and the suffering inflicted on them in quite a detailed way. So, the diaries and authors are able to tell us that casualties were relatively light during their first couple of months in France, until 20 January 1916, when they suffered a heavy bombardment at the front, which included the wounding, in a barrage of artillery, of Walter Charman, a 39 year old carman (barrow trader), with previous experience in the Boer War. Walter who had enlisted in April 1915, recovered after his injury, survived and returned home to his wife, Ethel and their five children at 78 St James Road, off Forest Lane. 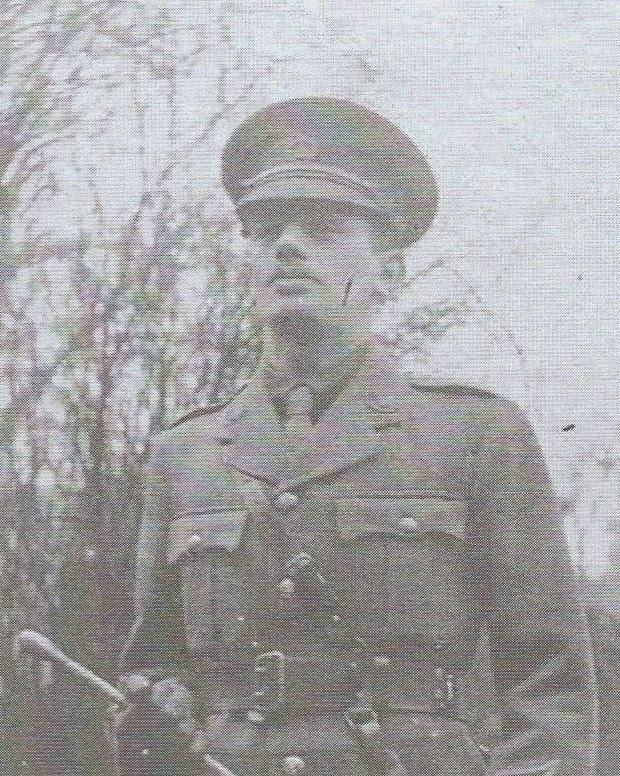 The Hammers Battalion was on the move in mid-February, a little further down the trenches, and on the 16th Arthur Ley Davies was "accidentally shot by a comrade". He lived at 105 Dames Road, with his parents and had enlisted in Stratford in January 1915 - as one of the first 300 volunteers to the Hammers Brigade. He was badly wounded, as a result of the shooting, and was shipped home, to recover slowly. Fifteen months later, however, he was to die at sea, while still in military service. "accidentally shot by a comrade"
The following day, Pte Frank Cowell, a 34 year old "enamel writer and glass divider" of 68 Gwendoline Avenue, Upton Park was carefully sandbagging his bit of trench, when he was spotted and shot in the stomach, by a German sniper. Dragged down the trench, he was quickly given morphine by Busby and was evacuated to the casualty clearing station at Bethune, but died two days later. Later that day Private Alfred Sekles, at 35 one of the oldest volunteers in the battalion, originally from Forest Gate, but by now married and living in Church Road, Manor Park, was hit. He was still breathing when he was taken to the same clearing station, but died of his wounds a week later. He is buried in the Bethune Town Cemetery. The battalion was soon on the move again, to the area around Verdun, marching in appalling weather, to relieve French troops and face the Germans at Vimy Ridge. 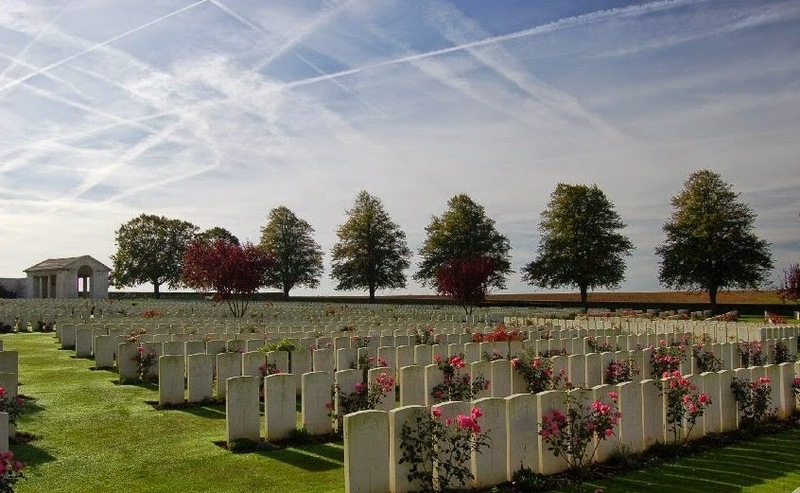 Towards the end of April William Busby was granted some very welcome home leave, and his diary recalls the experience. Arriving home at Sherrard Road, in the early hours, according to his diaries and Taylor and Alston, he woke the family and: "showed souvenirs and then to bed". Popular souvenirs would have been bits of captured German uniforms and equipment, like the distinctive spiked helmet, belts, buckles, bayonets and sometimes handguns or grenades. He was invited to supper by Bernard's father, then "BRP's younger brother", took him on a drive "through Chigwell, via Abridge to Theydon, then on to Loughton and Chingford, before arriving home for tea". His final day was spent at home with his father, before, on Friday 5 May: "Packed up things and left home. Train to L'pool St, taxi to Victoria. Just caught train. No seat in Pullman. ", where on his return to the front line, he was to encounter the consequences of gas attacks and the further killings of comrades in the trenches. Alan Holthusen, the medical officer, was working feverishly in very confined and extremely dangerous conditions. Since joining, Dr Holthusen had refused to wear his service tunic, opting instead to wear his tweed jacket, which had served him so well at his GP's surgery. He also wore a battered trilby for his time at the front until the initial introduction of steel 'shrapnel' helmets ... Altogether that night, Holthusen personally treated over ninety casualties from three different regiments, including those Hammers ... who were brought in by fearless stretcher bearers like Norman Bellinger. Unable to evacuate them because of the intensity of the shelling, Holthusen and his orderlies took on the status of an advanced dressing station (ADS). They finally managed to move the wounded to the rear by motor lorry between 6 am and 11 am. The second and concluding article about the role Forest Gate soldiers played in the "Hammers Battalion" will appear next week. 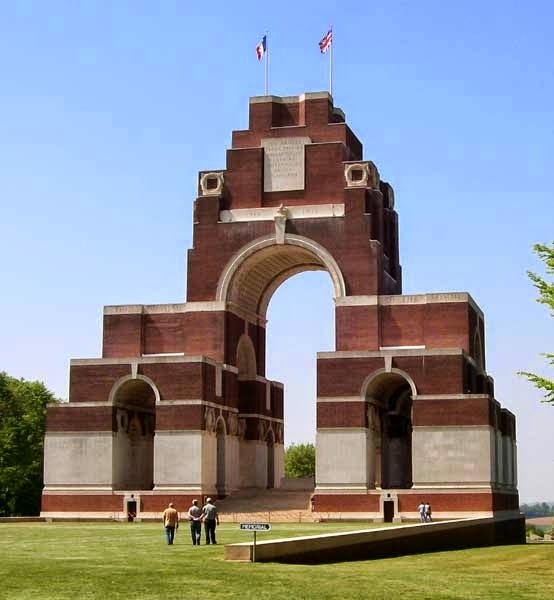 It starts with the Battle of the Somme and tells the story of the battalion's remaining months, and disbandment, due to loss of members, in 1918. 1. Thanks to Elliott Taylor and Barney Alston, whose dedication resulted in the publication of Up The Hammers - The West Ham Battalion in The Great War - 1914 - 1918, available at Newham Bookshop, and from the publishers, Amazon for £14.99. See here, for details. The book is available from Amazon, world-wide and has 60 never-before-published photos of the Hammers, a small number of which, as indicated have been reproduced above. 2. Elliott maintains an up-to-date blog on matters relating to the battalion, which is well worth a visit, via hyperlink:this. Elliott is always seeking out new relatives of soldiers from the Battalion, and will be happy to share your details of them (if you wish) and his further researches with you.